Nah bagi sobat yang sedang mencari latihan ujian nasional untuk tingkat SMP/MTs khususnya untuk pelajaran Bahasa Inggris, Zona Siswa kembali menghadirkan latihan ujian nasional yang diambil dari ujian nasional tahun 2013. Semoga latihan ujian nasional di bawah ini bisa bermanfaat. Check this out!!! A. Transjakarta provide a downloadable map on its website. B. Transjakarta's station is very small but comfortable. C. Riding Transjakarta during office hour is irresistible. D. Transjakarta charges Rp3.500 for its transfer fee. 2.How did Helen Keller meet her teacher? A. They met each other at Radcliffe College. B. Her parents took her to Alexander Graham Bell. C. She met Ms. Sullivan after her parents took her to Dr. Bell. D. Ms. Sullivan became Keller's teacher after getting an award. 4. What is the main idea of paragraph four? A. Hellen Keller became one of remarkable women in history. 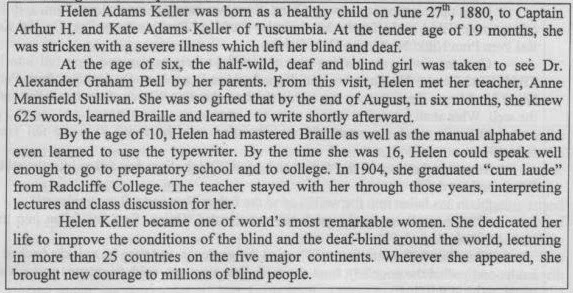 B. Hellen Keller became an inspiration for the blind people. C. Hellen Keller brought new courage to other people. D. Hellen Keller gave her dedication to the world. 7. What is the main idea of the sencond paragraph? 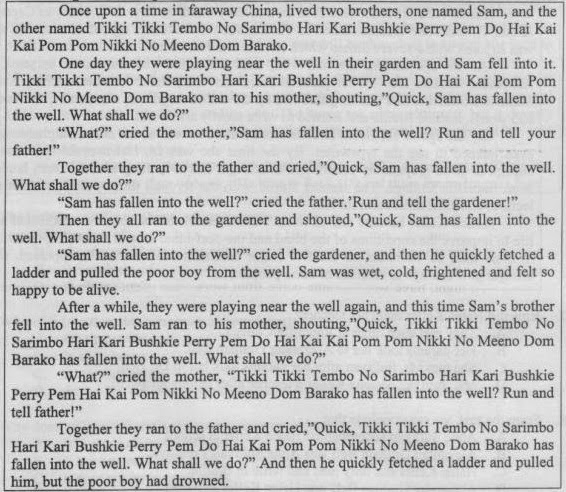 A. Tikki Tikki Tembo and his brother fell into the well. B. Tikki Tikki Tembo and his brother played in the well together. C. The two brothers always played in the well together. D. When the two brothers were playing near the well, Sam fell into the well. 9. What is the moral value of the text? A. Do everything that you can do! B. Do everything that you like to do! C. Don't do the same mistakes! D. Don't obey the parent's warning! 11. What is the main idea of paragraph 3? A. Mary was a diligent girl. B. Cleaning a room is Mary's habit. C. Mary loves to sleep all day long. D. Mary's room was dirty. 12. What can you learn from the text above? A. We have to fight to get a better life. B. No love is like mother's and father's. C. We have to sacrifice things for everyone. D. Be a diligent person to help others. 13. "She ran away into the woods without looking back." (paragraph 2) What does the underlined word refer to? 14. 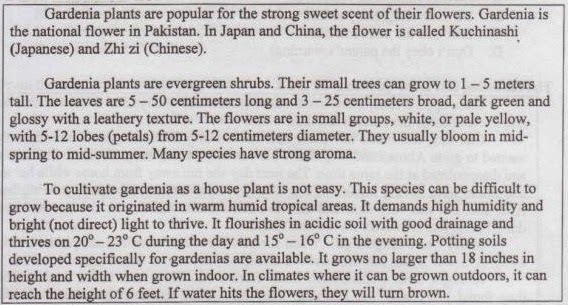 How tall is a gardenia tree? A. 3 - 25 cm. B. 5 - 12 cm. C. 5 - 50 cm. D. 1 - 5 m.
15. What is the main idea of the last paragraph? A. It is easy to plant a gardenia tree. B. A gardenia plant needs high humidity. C. It's not easy to plant gardenia as a house plant. D. A good drainage is important for gardenia plant. Last night, two houses were damaged by a landslide. Fortunately, no body was (18) ... but four people were injured. All of them were released from the hospital this morning after they were treated by the (19) ... . A group of soldiers were ordered to help local people fix the broken buildings. It was very hard to rebuild the houses (20) ... because they were seriously damaged. However, they promised to fix them in a month. Mr. Bambang is an English teacher. He speaks English fluently. His wife, Mrs Vanya is a (21) ... . She helps sick people. She doesn't speak English. Mr. Bambang has two children. They study English not only at school but also at home. They are (22) ... students. Their father teaches them every night, so they can speak English (23) ... He is very proud of them. 24. Arrange the sentences above into a correct paragraph. 25. Arrange these sentences above into a good paragraph.